This paper by Evan Mantzaris deals with elements of the Indian trade unionism in Natal, South Africa, in the late 1910s and 1920s. These were events in which Indian syndicalists like B.L.E. Sigamoney of the (syndicalist) Indian Workers’ Industrial Union and (syndicalist) International Socialist League, along with white syndicalists, like Bill Andrews and David Ivon Jones, played an important role. Besides union work, the League’s members promoted the idea of workplace ‘soviets’ with an eye on occupations and take-overs. SOURCE: Mantzaris, Evangelos. A. 1983. ‘The Indian Tobacco Workers Strike of 1920: A Socio-Historical Investigation’. Journal of Natal and Zulu History, VI, 115–125. Note: An incomplete version has also appeared on the internet under the title “1816-1939: Syndicalism in South Africa,” described as “a short history of radical trade unionism, class struggle and race in Southern Africa in the 19th and 20th centuries.” The dates are wrong (there was no syndicalism anywhere in 1816, and while the IWW-influenced ICU would last in Zimbabwe into the 1950s, there was no syndicalism in South Africa in 1939) and several paragraphs are missing, in that version. The Industrial Workers of the World (IWW), and the ideas, goals and organisational practices for which it stood, had an important influence on the early labour movement and radical press in South Africa. It also had an impact on neighbouring Namibia, Zambia and Zimbabwe. 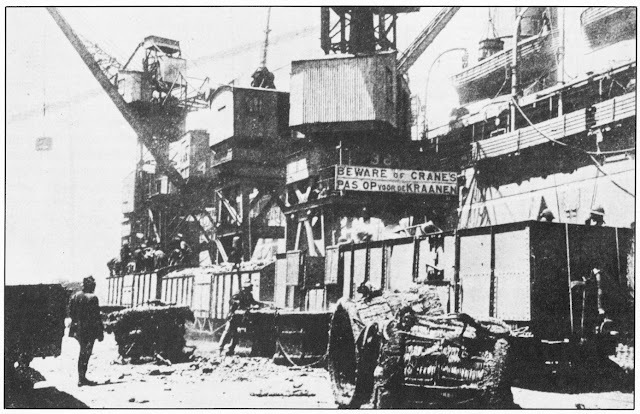 The Cape Town docks in 1919, site of the joint strike between the syndicalist Industrial Workers of Africa (IWA) and the Industrial and Commercial Workers Union (ICU). This paper examines the development of anarchism and syndicalism in early twentieth century Cape Town, South Africa, drawing attention to a crucial but neglected chapter of labor and left history. Central to this story were the anarchists in the local Social Democratic Federation (SDF), and the revolutionary syndicalists of the Industrial Socialist League, the Industrial Workers of Africa (IWA), and the Sweets and Jam Workers’ Industrial Union. These revolutionary anti-authoritarians, Africans, Coloureds and whites, fostered a multiracial radical movement – considerably preceding similar achievements by the Communist Party of South Africa (CPSA) in this port city. They were also part of a larger anarchist and syndicalist movement across the southern African subcontinent. Involved in activist centers, propaganda, public meetings, cooperatives, demonstrations, union organizing and strikes, and linked into international and national radical networks, Cape Town’s anarchists and syndicalists had an important impact on organizations like the African Political Organization (APO), the Cape Federation of Labour Unions, the Cape Native Congress, the CPSA, the General Workers Union, and the Industrial and Commercial Workers Union of Africa (ICU). This paper is therefore also a contribution to the recovery of the history of the first generation of African and Coloured anti-capitalist radicals, and part of a growing international interest in anarchist and syndicalist history. Revolutionary syndicalism – the strategy of bringing about a stateless socialist society through a revolutionary general strike in which organised labour, through its trade unions, seizes and places under self-management the means of production – played a central, but today, largely forgotten, role in the early twentieth-century South African labour movement. Furthermore, at least five unions were founded on the IWW model in this period. Four of these unions pioneered the organisation of workers of colour, most notably the Industrial Workers of Africa, the first union for African workers in South African history.